Beauty Spotlight: January | emma etc. While I love talking about the beauty products I use, I'm not someone who buys an abundance of new things every single month (okay, well maybe I am - but definitely not a massive haul of high end products), so I felt silly sharing my beauty favourites each month when I didn't have much to talk about. 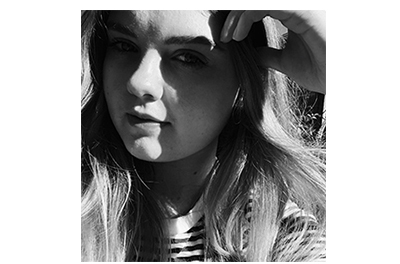 Enter a new feature called Beauty Spotlight - where I aim to talk all things beauty in a way that suits me, so hopefully I can give an honest depiction of where I'm at with beauty every month. Nothing revolutionary, but still. Here are the products frequently making it into my makeup bag, the ones I'm saying sayonara to, and most excitingly, the shiny things I'm lusting after. I'm notoriously bad at using SPF on my face under makeup. That was why I wanted to try a new one this summer, and I decided on the Mecca Cosmetica To Save Face SPF50+ Sunscreen. A few people have raved about this recently so I knew it was one I had to try. My first impressions are that it gives my skin a very glowy look and sits well under makeup. My skin always, always has reactions to many moisturisers I try on my face, but I'm hoping this one will be an exception. I haven't given it an extensive trial yet, but so far it's a lovely SPF that I think many people would love. Many mascaras can be pretty lacklustre. I'm not often loyal to them like I am, say, my foundation, but nevertheless I do enjoy trying new ones. I personally love a mascara that can curl and lift my lashes, add length, but most importantly a good dose of volume. Not asking for much, then? While I'm still going strong with the Tanya Burr Selfie Lash, I gave the Benefit Roller Lash a go this month. So far I love how much length and curl it gives lashes, but it doesn't quite give that intense volume I love. I do still really like this though, as I think it would look especially good on its own on a lighter makeup day. I'm going to keep using this, and who knows it may become a holy grail product. I've been continuously using my The Ordinary Coverage Foundation the past couple of months, but I've been itching to go back to my number one fave, NARS Sheer Glow. I'm officially now out of this stuff, but earlier in the month I finished up my second bottle and was reminded why I love it so much. It provides a nice coverage without looking or feeling heavy and is more long lasting than cheaper foundations. This is definitely one of the products I will continue to invest in because I haven't found another base I truly like as much. I really enjoyed using up my first bottle of The Ordinary Hyaluronic Acid 2% + B5 - it made it skin feel so even and smooth - perfect for applying before moisturiser. However this month my skin has been actually horrible, and I'm not entirely sure why. It may be any number of things - my diet, hormones, or I'm using the wrong products. For now I've decided to put this on the back burner and stick to a simple cleanser and light moisturiser while I work out what is wrong with my skin. I did really love this when I first used it, but overtime my skin has dried out - this may be due to a cleanser I use though. I did buy another one of these and I may use it occasionally, but we'll see. Earlier this month I did a post on the Products I Regret Buying. As well as getting rid of those products, I will also be saying goodbye to the Girl Undiscovered Stumbled Across Paradise Mask. While I did quite like it at the beginning, it always made my skin go super red afterwards, like I'd been sunburned. I think this was giving me an allergic reaction, or my skin was obviously just too sensitive. Are you sensing a theme? 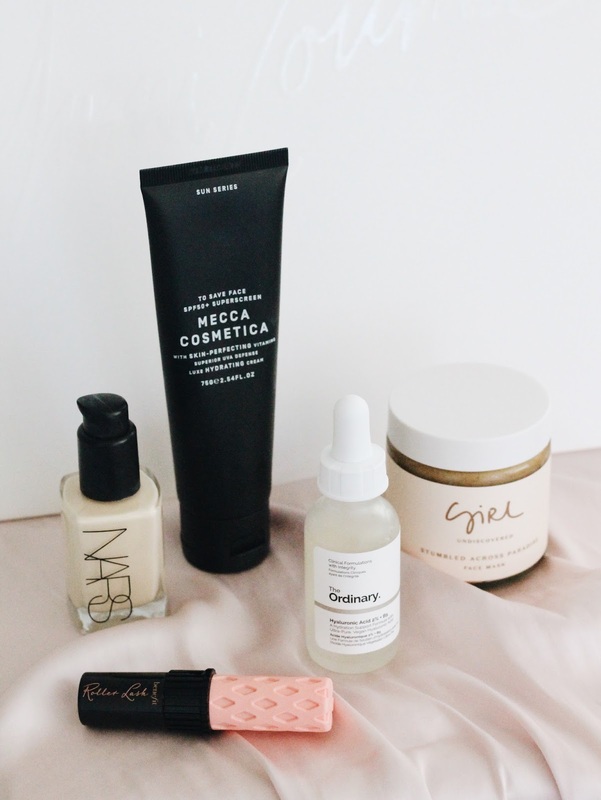 Enough of the grumbling about my skin, let's talk lust-worthy beauty products. This month I've been on a spending ban and I've actually managed it, but I'm afraid next month all my hard work will come undone. I am dying to buy something new, however I want to make the process more of a lengthy deliberation than impulsively buying. This month I've had my eye on the NARS Smudge Proof Eyeshadow Base because it's about time I bought a decent eyeshadow primer (this one has had some raving reviews). Apart from that, the NARS Wanted Eyeshadow Palette looks like what dreams are made of, but I think it's only available in certain countries. I'd love to know your thoughts on these products and what you're lusting after this month! Love the Mecca sunscreen - it's my #1 rec to people who want to use a sunscreen, and it's so awesome that it's SPF50! Also I highly rate the NARS primer, I use it in my mua kit! I love this post so much and this is such a creative way of incorporating beauty content into your blog. To be honest, I find monthly favourites kind of uninspired and boring, and I'd only end up repeating myself if I did them too. It's much more interesting to read about someone's overall beauty situation and I love how you've rolled favourites, disappointments, trials, empties and your wishlist all into one! I always get so excited whenever I see people buying the Mecca sunscreen because it's one of my favourite products in the whole entire world! I've probably been using it for about six or seven years now and I don't see myself ever using anything else. I love that it has so many awesome ingredients in it and that doesn't apply or smell like a regular sunscreen. Hopefully you don't end up having a reaction to it because it'd be such a shame for you to miss out on this amazing product! NARS Sheer Glow is my all time favourite foundation too! I'm coming to the end of my current bottle and I'm desperately hanging on to it because I'm too poor to repurchase it right now, haha. It's one of those foundations that's perfect for every occasion. I can totally vouch for NARS Smudge Proof Eyeshadow Base; it instantly became my new favourite eye primer as soon as I started using it. My eyeshadow doesn't budge at day! I didn't think anything of the NARS Wanted Eyeshadow Palette when I first saw it, but then someone on Instagram Stories posted swatches and it looks beautiful! I don't think I'll buy it, but I wouldn't mind testing it out in-store. Australia/NZ are always slower on the new releases, so hopefully it still comes to Mecca! Thank you! I'll continue using the sunscreen, it's going well so far. That's so good to know about the primer - a lot of people seem to love it! I feel like the Wanted palette is something I'm lusting over but maybe won't buy? But we'll see. I just think the shades are so lovely, it's like my dream palette! NARS Sheer Glow is my favourite foundation too - I've tried so many but always find myself coming back to this one. The Smudge Proof Eyeshadow Base is definitely worth having in your collection! It keeps your eyeshadow in place all day and prevents creasing like nothing else! You've reminded me to pull out my sheer glow foundation again! That stuff is SO good. Loved this post - I really like roller lash for lengthening, but its not the best for volume for sure!